OrgDS.org offers simple and easy-to-integrate SMS connectivity for system application and web developers. 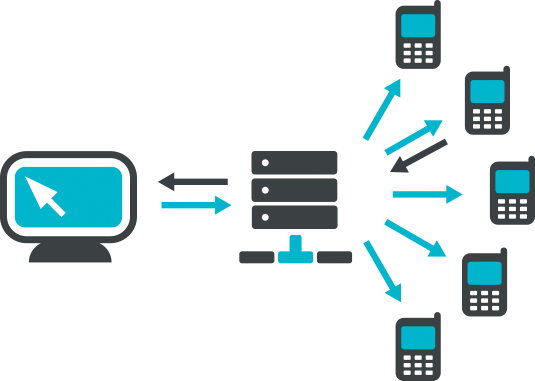 With our Application Programming Interface (API), integration is simple, fast and reliable. Our API allows developers to connect to our website from Desktop, Mobile and Web Applications to send messages, check sent messages, check SMS balance, and check scheduled SMS. API-NORMAL provides a direct connection to a user’s account. It requires the Username and Password of the user to connect and execute all the possible commands. SENDERID: This variable is applicable only when sending message. It is the SHORT ID/NAME of the Sender with which recipients will receive the message. SENDERID cannot be longer than 11 characters. If no SENDERID is set, your default Sender ID as set on your profile will be used. MESSAGE_TYPE (optional) value may be either 0 or 1. 0 means the message should be sent using Normal Route. When Normal Route is used, phone numbers on DND (Do Not Disturb) will be removed and no SMS unit will be charged for those numbers. This (value 0) is the default value if no the variable is not set or set with unknown value. 1 means that all messages should be sent using Corporate Route. When Corporate Route is used, recipients on DND will receive the message but you will be charged double for each SMS, i.e. 2 units of SMS will be charged for each page of the message you send. This variable is applicable only when sending message. It allows you to set a future date and time when you want a message to be delivered to specified recipiet(s). The date and time value must be in the YYYY-MM-DD H:i format (e.g. 2017-11-17 17:20); the time should be in 24 hour format. If not set, the message will be submitted for immediate delivery. REPLY: “600” if successfully submitted or an “ERROR_NUMBER” without quotes.